The purpose of this chapter is to describe in depth how to genetically engineer, stably transfect, screen, produce, and purify Fc fusion proteins. A general outline of the following procedures is depicted in Fig. 1. Expression of soluble Fc fusion protein is entirely dependent on a mammalian expression system. The protein expression system described here involves the usage of an expression vector (pEE12) that is under the control of a strong viral promoter (6). The viral promoter enables the coexpression of the Fc fusion protein with glutamine syn-thetase. Transfectants that maximally express the Fc fusion protein in addition to glutamine synthetase are positively selected using a murine myeloma cell line (NS0), which expresses insufficient amounts of glutamine (7,8). Finally, utilizing a simple screening technique, such as enzyme-linked immunosorbent assay (ELISA), allows the investigator to identify productive transfectants, which can be grown in large-scale culture (9) for subsequent chromatographic purification. By these methods, the investigator is provided with a reliable and efficient method for solubilizing proteins of interest. Fig. 1. Overview describing how Fc fusion protein is expressed and produced on a large scale. The final "transfection vector" is transfected for expression in the murine myeloma NS0 cell line. 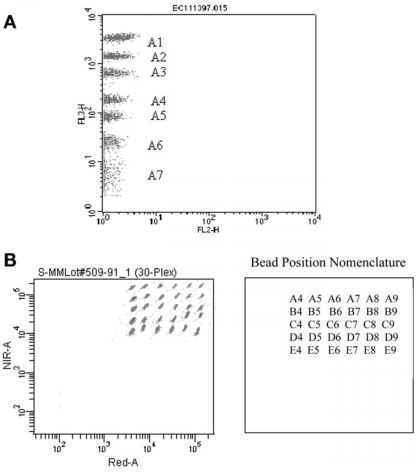 Expression of Fc fusion protein is verified by moiety-specific ELISA. The highest-producing clone is then grown to large scale for purification. 1. cDNA encoding the protein of interest. 2. MacVector or DSGene DNA sequence analysis software (see Note 1). 4. Thin-walled PCR tubes, autoclaved (Bio-Rad, cat. no. 223-9473). 6. 200 U Vent polymerase (10X PCR buffer included) (NEB, cat. no. M0254S). 7. Milli-Q deionized water (dH2O), autoclaved. 12. 0.5 M EDTA: dissolve 18.6 g in dH2O, adding NaOH to dissolve. Adjust to pH 8.0; bring to 100 mL total volume with dH2O. 13. 5X Tris-borate-EDTA (TBE) buffer: 54 g Tris base, 27.5 g boric acid, and 10 mL of 0.5 M EDTA, pH 8.0. 14. Glycerol (glycerin; Fisher, cat. no. G33-500). 15. Bromophenol blue (Bio-Rad, cat. no. 161-0404). 16. 6X Glycerol buffer: 7 mL of 0.5X TBE pH 8.0,3 mL glycerol, and 25 mg bromo-phenol blue. 17. Agarose, molecular biology grade (Fisher, cat. no. BP1356-100). 18. Ethidium bromide (EtBr) prepared at 10 mg/mL (Sigma, cat. no. E8751) (see Note 2). 19. 1% Agarose gel: mix 0.5 g agarose + 50 mL of 0.5X TBE buffer in an Erlenmeyer flask, and boil in microwave until dissolved (<1 min). When mixture reaches 60°C, add 2 pL EtBr, swirl to mix, and pour. 21. Ultraviolet (UV) transilluminator (Fotodyne or similar). 22. Sterile scalpels (VWR, cat. no.100229-885). 23. QiaQuick PCR Gel Extraction Kit (Qiagen, cat. no. 28104). 24. Electrophoretic apparatus for resolving agarose gels (Owl Scientific or similar).